This is what my favourite Sunday mornings look like... snuggled up in bed with a good book, coffee and Matt in the kitchen making breakfast! I've been known to spend entire Sundays in bed with my nose in a book, so I feel pretty lucky that he's around to feed me. His speciality usually includes frying up some veggies, scrambling a few eggs and lathering slices of toast with butter & vegemite (of course). 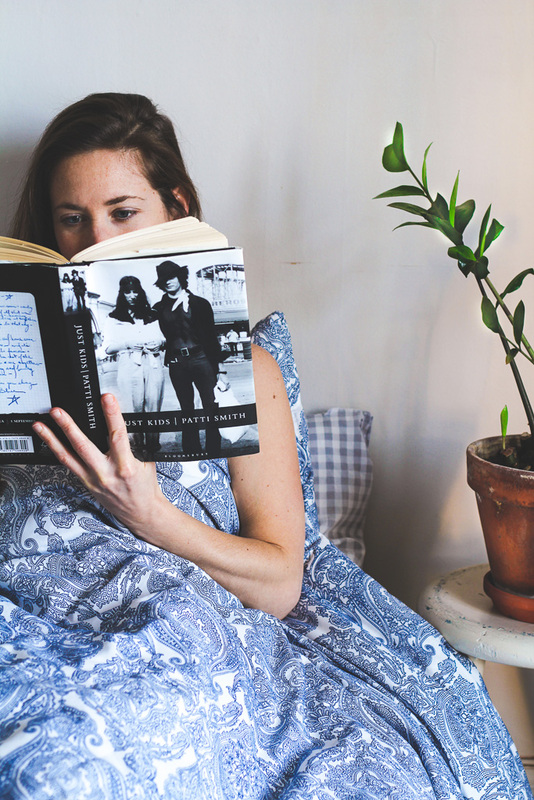 Maybe one day we'll create his recipes and make a special edition for the blog: The Man's Guide to Breakfast in Bed for his Beautiful Girlfriend. 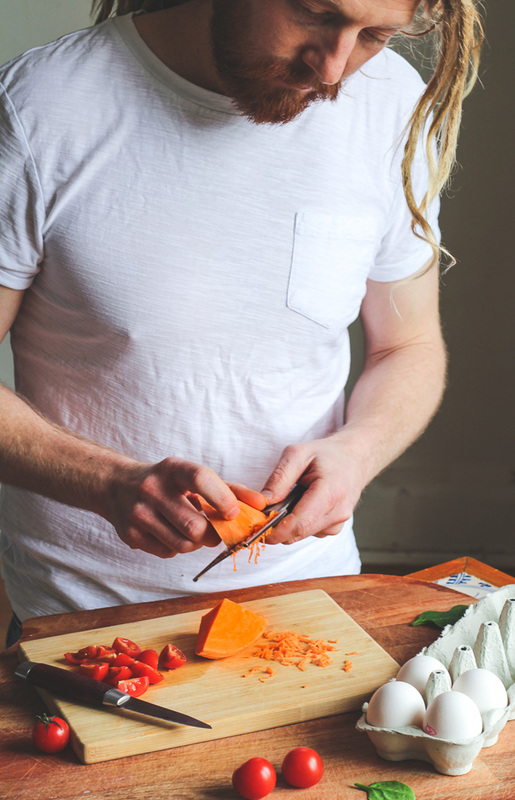 But for now, he's cooking up my Sweet Potato Rösti and topping it with veggies & cottage cheese, which makes a perfect brunch recipe and also an easy weeknight dinner! And just a little self-love note: don't ever feel guilty about spending a day relaxing in bed or curled up on the couch reading a good book or whatever it is that seems lazy but makes you feel good. Sometimes in our lives it is impossible to even imagine having the time for such a carefree day. But life goes through all kinds of ups & downs, it changes speed from a snails pace to 100 miles a minute in the blink of an eye, and back again. The only thing you can be sure of is that everything will change. So do what feeds your soul when you can and cherish every moment of it. A savoury potato "pancake" full of vitamin A rich sweet potato to help support clear, healthy skin. This dish makes the perfect weekend morning brunch or a quick weeknight dinner. Top it with protein-packed cottage cheese and antioxidant-filled tomatoes and spinach to keep you healthy & glowing! Preheat oven to 100 C | 200 F.
Peel and grate the sweet potato. Using a clean dishtowel press out excess liquid from the potato. In a medium bowl whisk the two eggs and stir in grated sweet potato. Season with salt and pepper. Place a medium frypan on medium high heat and add in coconut oil. Scoop half the egg mixture into the frypan and spread out like a pancake. Fry for 5 - 7 minutes until browned, flip and fry for a further 5 minutes. Once cooked, place rösti in the oven to keep it warm and then add remaining egg mixture to the pan. Continue to fry on both sides. Meanwhile dice tomato and red onion, and slice radishes. Bring water to a boil in your kettle. Place spinach in a bowl and pour over boiling water. Leave for 20 seconds until just wilted, then drain. 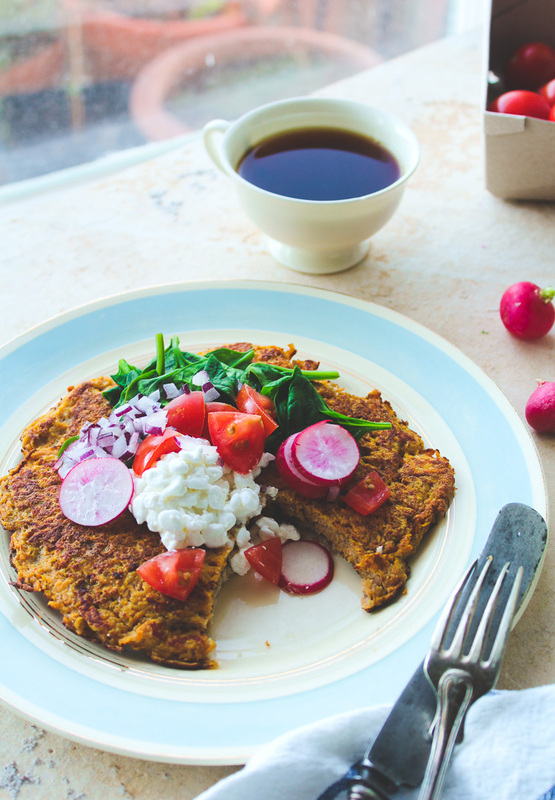 Serve rösti topped with cottage cheese, tomato, red onion, radishes and wilted spinach. Enjoy! Tip: If haven't tried this, but to make it vegan you could try using chia seeds & water to substitute the eggs and replace the cottage cheese with coconut yogurt or vegan sour cream.